The best and tastiest Nasi Dagang (“trading rice”) in the world can be found in the east coast state of Kelantan, Malaysia. Nasi Dagang is made by steaming the Nasi Dagang rice in coconut milk and fenugreek seeds. 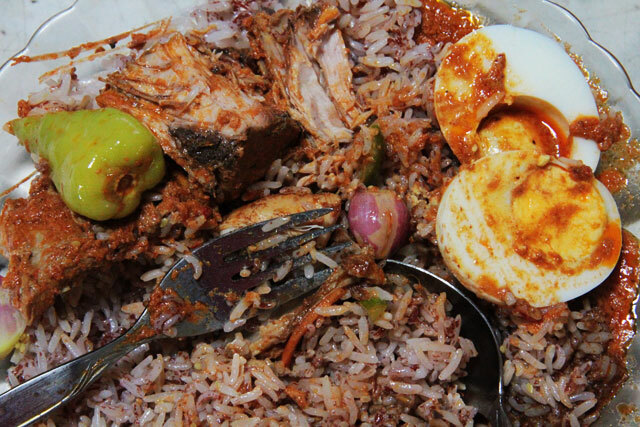 Nasi Dagang is then eaten with fish or chicken curry and extra ingredients such as fried shaved coconut, hard-boiled eggs and vegetable pickles. Nasi Dagang can be considered as a festive dish in Kelantan because it is prepared during festivals during wedding, Hari Raya and Chinese New Year. If you visit Kelantan, you should not miss this delicious food that is widely regarded as the official dish of the state of Kelantan. Gulai Ikan Aya/Gulai Ayam (Tuna Curry / Chicken Curry) – this accompanying dish is only specially prepared for Nasi Dagang. Unlike Indian curry, this dish does not use curry powder but fish or chicken were cooked in coconut milk mixed with spices such as lemon grass, galangal, chilli paste and turmeric. Ikan Aya or Ikan Tongkol (tuna) is the standard choice of fish but other fish or chicken can be used as well, such as salmon and tenggiri, but it won’t be as tasty as good as tuna. Prawns are also used sometimes, however the dish is prepared slightly differently. Hard-boiled eggs – hard boiled eggs are cut into two, four or eight slices. Fried Coconut – coconut is freshly shaved, mixed with sliced shallots and fried until golden brown. Acar Timun (Pickled Cucumber) – the vegetable is pickled in rice vinegar and sugar. The vegetables commonly used are cucumber, chilli and carrots. Sambal – Nasi Dagang is best eaten with chilli sambal. This entry was posted in Nasi Dagang and tagged Nasi Dagang. Bookmark the permalink.